SmartPlate is the world’s first intelligent plate that instantly tracks and analyzes everything you eat, so you never have to track meals manually again! Prior to starting Fitly, Anthony founded a successful transportation logistics company which he grew to a 30 person team and sold under eighteen months. He also held executive & managerial positions in both finance and retail; as a mortgage broker on Wall Street and DM for a family owned and operated Blockbuster Video franchise in the Greater Philadelphia Area. He turned his first profit when he was 12. 1) How/when did the idea come about? I came up with the idea after almost losing my father to triple bi-pass surgery. When the surgeon told me “you know, your father could have avoided this if he ate a bit better and was a little more active”, I started reading health books back to back. One book in particular, left an impression, The China Study by Dr. Colin Campbell. In his book, Dr. Cambbell explained that no human should ever have to suffer a stroke are die of a heart-attack, and that poor nutrition is a key contributor to this global pandemic. 2) How did the team form? Forming a solid team early on is tough for many startups, and it was tough for us too. But with limited funds, a novel idea and some good ol’ passion –we were able to attract some of the world’s best researchers and machine learning engineers. We even hired someone who cold called us with a pitch that was so good, we simply had to meet her – Julia Nitsche. 3) How long did it take to make the first prototype and how much research went into it? It took us approximately one year of research and discovery. Understanding the customer, the customer journey, portion distortion, existing solutions, strengths/weaknesses etc. before we arrived at the optimal solution, SmartPlate. From there, it took us 4-6 months to complete our first ‘alpha’ working prototype. 4) Which retailers do you hope to partner with and do you plan on introducing any more products? We have agreements in place with Bed Bath & Beyond, Target, Amazon.com, Jet.com and hope we can partner with Best Buy, Walmart, Sams Club, and many more. Absolutely. 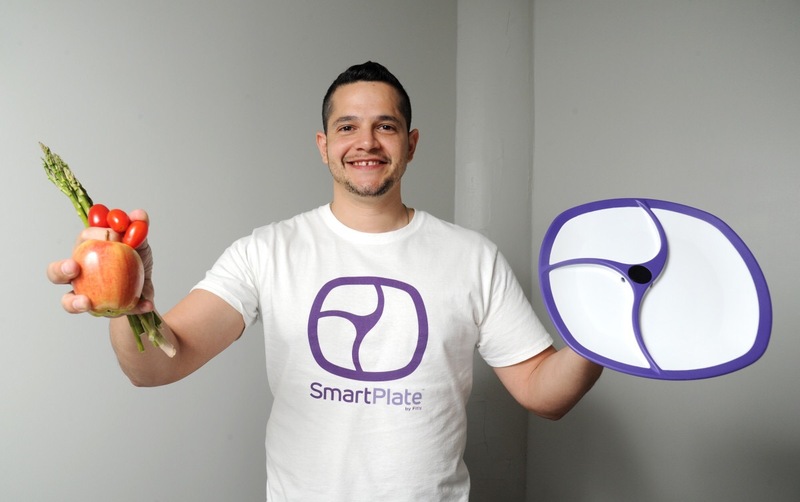 SmartPlate is just the beginning. 5)How did your appearance on Shark Tank come about and how did you experience on Shark Tank help your business? During our Kickstarter campaign, a Shark Tank producer approached us via email and at the time, we were so innundated with the campaign that we did not respond to her. A week later, a second Shark Tank producer emailed us, unbeknownst to her other colleague so this time, we replied and were asked to audition for the show. We prepared rigorously for the appearance and covered all questions & answers that the sharks could potentially throw at us. This helped our team’s confidence and ability to hold it together in the tank. The exposure has been incredible even though we didn’t get a deal! For example, we have been approached by several large VC & PE firms interested in investing. We got a very nice bump out of it and our site saw over 100,000 unique visitors which led to tens of thousands in sales! 6)What advice would you give aspiring entrepreneurs and what are your future plans? The best advice I can give budding entrepreneurs who may be pitching investors is — over prepare. Once the material becomes second nature to you, you are less worried, less nervous and you’ll be ready to kill it. We plan to help millions of people around the world eat better, feel better and live life. SmartPlate will help them get there! We would like to thank Anthony for speaking with us.